On our Currently page we let you know where we are and we track a variety of statistics such as: days on the road, days of paid camping, days we’ve been plugged in, etc. Based on the numbers above, since we hit the road on March 21, 2015, we’ve been living entirely on solar power for only 79% of the time. So, what’s going on? It turns out, while living solely on solar panels is doable, it’s not ideal in all regions and seasons. Looking back at my spreadsheets (Jerud hasn’t cornered the market on spreadsheets in this household), I realized it was mostly two winter destinations that decreased the number of days we lived on solar: Crystal Mountain Ski Resort (2016) and the Carolinas (2017). In the past, snowboarding has always meant a short but expensive vacation, and gambling on whether the snow would even be any good. So, we decided we wanted to spend a season at a ski resort where we’d actually have the chance for some good snow on our terms. So, we worked and lived in the Toaster at Crystal Mountain Ski Resort. Unfortunately, ski season and solar panels don’t go hand-in-hand. There was no way the Toaster could’ve been solar powered for the whole winter season. This was the Pacific Northwest! Snow meant it was cold which meant running two space heaters constantly. On the days it didn’t snow, all we got was shade under the tall evergreens, gray skies, and rain. None of which was sun. But we spent 134 days living there. Then we spent several months in the Carolinas, of which 82 days were plugged in. While wintertime in the Carolinas is not anywhere near as dreary, snowy, or rainy as the PNW, it still doesn’t have ideal weather for a fully solar-powered rig. Especially since our boondocking spot had tall trees shading our panels for most of the shortest winter days and we had a freakishly cold winter. Since we don’t have any propane appliances or a generator as backup, what do we do when there isn’t enough sun to power our batteries? We have to plug the Toaster into grid electricity. So that’s what we did at Crystal Mountain and in the Carolinas. If it hadn’t been for those two places, the percentage we’ve lived on only solar power would be 98%! But still not 100%. There are other reasons why we’ve had to plug the Toaster into grid electricity (aka shore power) every once in a while. On rare occasions, the only places we could stay overnight were RV parks, and since we were paying for it anyway, we used shore power. Sometimes our timing has been off and we ended up in a region at the “wrong” time of year (more overcast than sunny days). 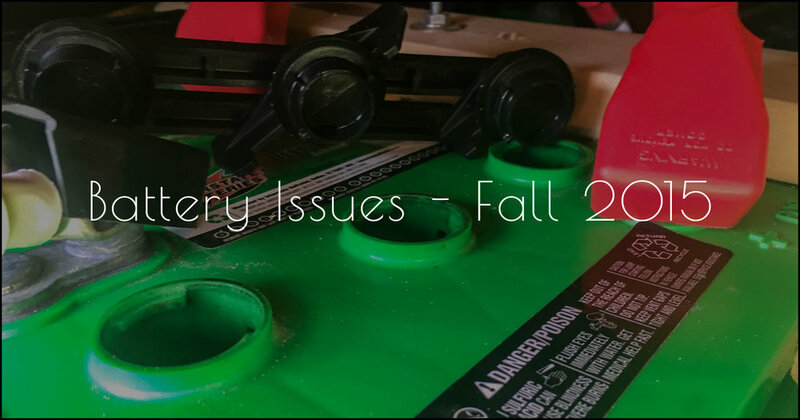 We also made beginner’s mistakes with our lead acid batteries and then decided to upgrade our batteries to lithium, which meant using shore power both while diagnosing our problems and during the switch over to new batteries. Batteries require maintenance, which usually can’t be done from the solar panels: Our old lead acid batteries had to be equalized regularly and our current lithium batteries need to be balanced from time to time. Why do we care about these numbers? I guess we felt (and sometimes still do) that we had something to prove – to ourselves and to everyone else – that living in a rig powered 100% by solar without propane or a generator is doable. Eventually we realized that it would be easy to make the numbers 100% - we’d just stay in the desert all year! What we really want to show is that you can travel in a solar powered RV to places you want to go and still make it work. We don’t choose where we go only based on the sun. We choose where to go and then make our solar work. And we’ve come to accept that the few occasions we do plug in aren’t a big deal, because the majority of the time the Toaster’s carbon footprint is miniscule. Now that we have a lot of experience under our belts, we can confidently say that living in an all solar powered rig is possible, even if our own track record isn’t perfect. We still advocate for others to convert their rigs to use solar power only and experience the satisfaction of consuming no fossil fuels to power your daily life.